4 October 2010, at 12:10p.m. GERMANY - A remarkable number of people came to Westrum in the North German district Emsland: approximately 600 visitors followed up on the invitation of Olinger Geflügelmast GmbH & Co. KG to attend the Open Day and see their eight new houses for broiler growing. The owners ordered Big Dutchman to fit the houses entirely with the most modern housing equipment – given the altogether 320,000 bird places in this project, this is a big compliment for the German equipment supplier. 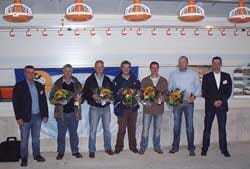 Hermann-Gerd Roter (far left) and Werner Meckelnborg (far right), both from Big Dutchman, congratulate the partners of Olinger Geflügelmast GmbH & Co. KG to their new farm complex. On the picture from left to right: Carl-Ludwig Westerkamp, Ferdinand Busch, Christoph Westerkamp, Aloys Pott and Gerd Schwal. 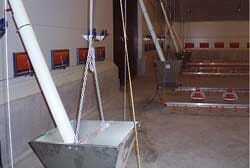 One of the highlights of the Open Day was AMACS, Big Dutchman's Agro Management and Control System, which provoked great interest among the visitors and for a good reason: AMACS permits the farm manager to control all essential functional areas easily by mouse-click, for example, the feeding system or the house climate. 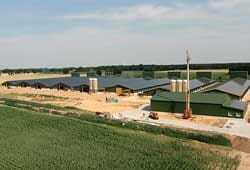 AMACS can be used equally well for individual houses or on large farms with several buildings. AMACS operates on the basis of network technology in connection with modern communication technology. This allows the farm manager to constantly record data, and monitor and control each of the 20 x 100 meter new houses in real time. Each of the poultry houses can either be controlled directly on site, or via remote control: entries can, for example, be made in the farm office at a Windows PC or via a smartphone such as an iPhone or Blackberry. Furthermore, Big Dutchman service staff can access the system via remote control from the Calveslage headquarters for rapid help, if required. Another great advantage is the user-friendly interface of AMACS. In addition to AMACS, several other Big Dutchman classics were featured on the Open Day. Visitors were also able to inspect HEAT MASTER, a warm-water convection heating system, the efficient Augermatic feeding system and the Fluxx feed pan, one of Big Dutchman’s global bestsellers. The Fluxx360 feed pan which is installed in the houses of Olinger Geflügelmast GmbH, is the youngest member of the renowned Fluxx product family. 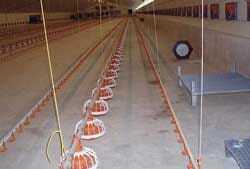 Its diameter of 360 mm offers 14 per cent more feeding space in comparison to feed pans with a diameter of 330 mm. Another new feature are the four cleaning apertures which ensure that liquid residues drain off completely even if the pans are closed. Of course, Fluxx360 also features all the other technical details that have made the Fluxx series a bestseller. Among these is, for example, the centrally actuated 360-degree flooding mechanism which ensures a high feed level in the pans during the first couple of days when the pans sit on the ground. 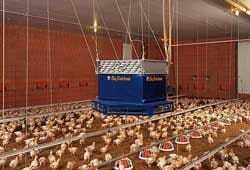 After that, based on the age and the size of the birds, the pan line is raised step by step and the feed level inside the pan decreases. This way, Fluxx360 meets both the requirements of day-old chicks and of heavy birds in the final growing phase.